Lumbar Synovial Cysts or Facet Cysts can be a source of pain to the back. In most situations, formation of these cysts are typical of the manifestations of degeneration and arthritis of a joint. In the knee, the Synovial Cyst is also called a Baker’s Cyst. The arthritic condition of the knee causes production of fluid in the knee joint. Because of the fluid buildup, sometimes a small opening occurs in the joint capsule, and a bubble develops with the fluid. Over time, the bubble enlarges, causing the development of the so called Baker’s Cyst. The Cyst, is caused by the arthritis and fluid production in the knee. By definition, you need some internal joint irritation such as arthritis, or synovitis to cause the development of the fluid. This is the exact same process that occurs in the lumbar spine, leading to the Lumbar Synovial Cysts, or Lumbar Facet Cysts. 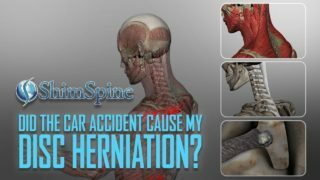 In the Spine, however, the joints are much smaller, and there are often nerves closely oriented to the facet joints, thus, there is potential to develop a pinching of the nerves, or spinal stenosis. In relationship to the Lumbar Synovial Cysts, the fluid builds up and escapes the facet joint, and can either bubble away from the nerves, or in the more painful situation, bubble into the space that is normally occupied by the nerves. 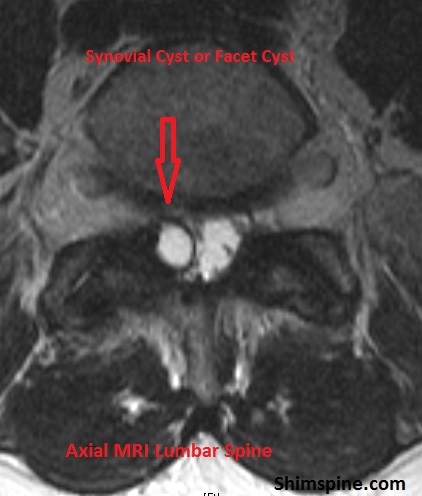 In the above featured image, it represents the Axial MRI view of a lumbar spine, with an obvious fluid filled cyst emanating from the facet joint. It causes a well defined “bubble” that crowds into the spinal canal, and resulted in nerve irritation. The facet cyst’s lining is well defined, and took many months to develop. Initially, the cyst may grow very slowly, and the body can accommodate the subtle pressure on the nerve. But, at a certain amount of pressure, the Cyst can become symptomatic, and cause both back and nerve pain. For some Lumbar Synovial Cysts, movement of the facet joint can increase or decrease the fluid collection within the cyst. During surgery, Surgeons can see some of the Cysts located outside of the canal increasing or decreasing in size as we mobilize the facet joints. I am certain that also happens to some of the cysts located in the spinal canal, but not always. Lumbar Synovial Cysts or Facet Cysts that have two way movement of fluid in the Cysts are potential amenable to injections of corticosteroids. The so called Facet Injection can decrease the size of the cyst, and relieve some of the pains associated with the mechanical pressure. In addition, injections of the corticosteroid also decreases the inflammation associated with the joint arthritis or synovitis. For other Lumbar Synovial Cysts or Facet Cysts, there is a ball-valve type mechanism that only allows fluid to move into the cyst, and not back out. In this situation, Facet Injections may still be beneficial, but many Surgeons will opine that long term, only Surgery will solve any nerve compression caused by the Cyst. Surgical options include removal of the cyst as well as removal of the bone spurs that caused the cyst. Other options include surgical fusion of the effected facet joint. Lumbar Synovial Cysts are almost always associated with degeneration, and commonly occurs later in life. It is a relatively rare occurrence in Young Adults. Lately, I have been asked about development of Synovial Cysts in relationship to Trauma. In my opinion, patients with pre-existing facet degeneration can have increasing back pain after trauma secondary to exacerbation of the underlying degenerative condition. However, development of a Synovial Cyst, by definition, is secondary to fluid buildup from prior arthritis or synovitis. 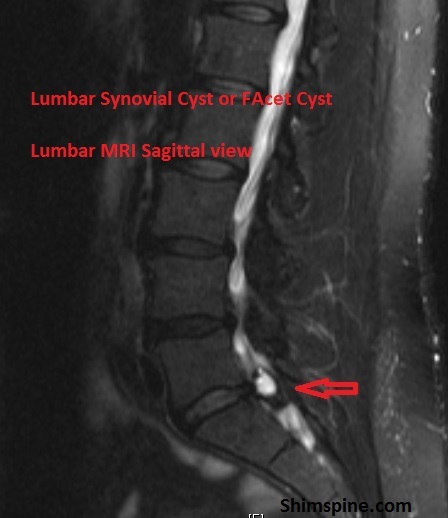 While trauma may make a cyst more symptomatic, it does not cause a Lumbar Synovial Cyst. As these Cysts typically present in older patients, it is more likely that a Synovial Cyst identified after trauma is an incidental finding, rather than an acute new injury. In young adults, the presence of synovial cysts are so rare, that there needs to be concerned about other underlying medical conditions such as prior degeneration, rheumatologic conditions, or other joint inflammatory conditions. Most Spine Specialists give a concensus opinion that Lumbar Synovial Cysts are a manifestation of a degenerative process effecting a Lumbar Facet Joint, and the subsequent development of a Synovial Cyst. Trauma, in isolation, cannot cause a Lumbar Synovial Cyst. Thanks for this article on lumbar synovial cysts. I am 58 yo female with a L4-L5 synovial cyst. I had a MRI in January and the cyst measured 9mm by 9mm. At that time I had back pain and right leg pain. I was found to have spondylolisthesis and am awaiting fusion surgery. My symptoms have changed over time and I now have pain down both legs and now also have pain while sitting in my recliner. Due to the change in pain distribution, I had another MRI recently and it shows the cyst is now smaller (4-5 mm). I am puzzled by my continuing and progressing pain while the MRI shows the cyst is smaller. I have not yet had a chance to discuss this with my surgeon. 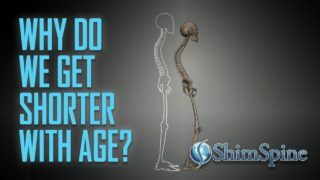 I was glad to read in your article that some cysts can change in size due to movement of the facet joints. I was thinking maybe it spontaneously ruptured and released irritating contents causing the now bilateral leg pain. What are your thoughts? Thanks!